No I did not spell Frostop wrong, it’s the name of one of my favorite root beers. Not everyone is lucky enough to have Frostop in their market, it’s a shame for them. I purchase mine at a store called Rural King. I will supply a link so everyone can check on availability in your area. Frostop Root Beer has that old-fashioned root beer taste. When you pour an ice-cold glass of the root beer it foams just right. The taste is smooth and natural. When I taste the root beer I get a distinct vanilla flavor and I also get a hint of cinnamon or something similar. I just know that it taste great. 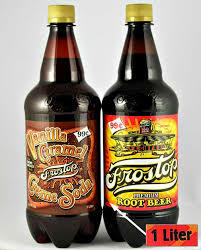 The company also sells a Diet Root Beer and for those that like a different flavor you can get the Carmel Vanilla Cream Soda. As always I prefer the Diet variety but all three flavors taste great. This entry was posted in Soda and tagged Beverage, diet soda, drink, home brew, old fasioned, Pop, recipe, root beer, Unique drinks. Bookmark the permalink. I like A & W. I don’t think I’ve every had Frostop.